Our volunteers in Ghana have been incredibly supportive of ‘Football Pitch Reading’, a new community-based project implemented in the Cape Coast region at the beginning of June. Through this initiative, volunteers teach the local children how to read at their weekly football practices. Projects Abroad has partnered with a local youth football academy in an underprivileged community where the project takes place. “The kids love football but do not show any interest in schooling and pay little attention to education,” says Eric Ewusie, Assistant Regional Coordinator in Ghana. The project uses football to interest the children and get them to attend practice, where they will then be encouraged to read in a fun and interactive environment. 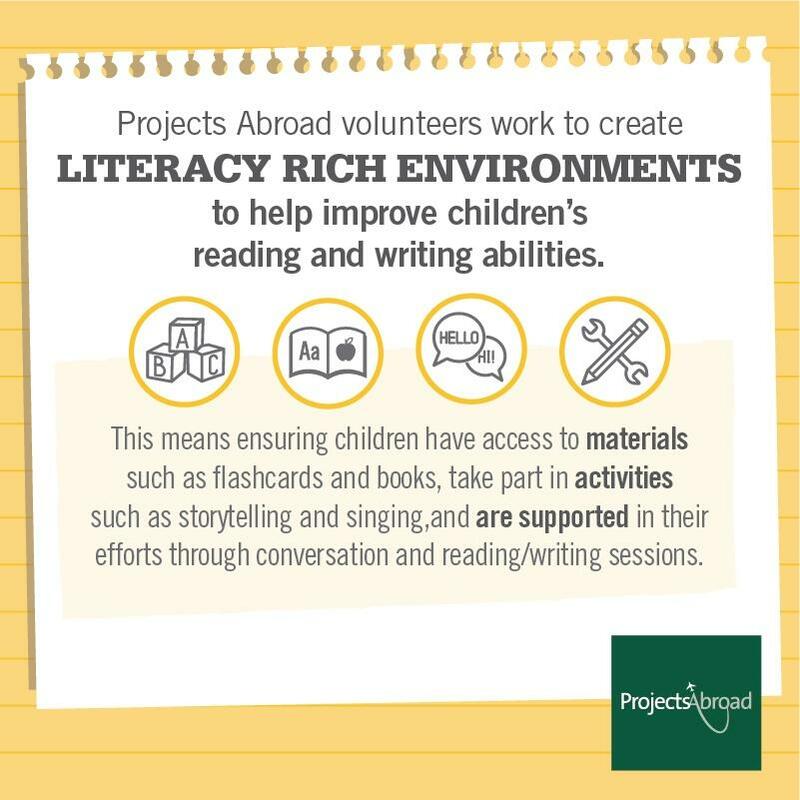 This is just one of many literacy initiatives run by Projects Abroad volunteers around the world, and comes ahead of the 50th anniversary of International Literacy Day, celebrated on 8 September 2016. 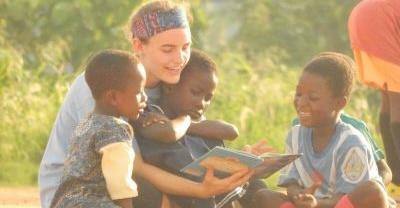 Literacy development is a core focus area for all Projects Abroad Care and Teaching placements. Our primary aim is to develop what we refer to as ‘Literacy Rich Environments’ at our projects to help improve children’s reading and writing abilities. A Literacy Rich Environment means ensuring children have access to materials such as flashcards and books, take part in activities such as storytelling and singing, and are supported in their efforts through conversation and reading/writing sessions. At each placement that has chosen to focus on literacy as one of their primary goals, we measure children’s access to resources, activities and support according to a checklist with three scoring levels – whether the placement needs considerable help, some help or no help at all. Our ultimate aim is to get all placements to the level where they rank highly for all three areas – resources, support and activities. In order to do this, volunteers focus on problem areas which are uncovered through regular use of our checklists. For example, if a placement has rhyming cards and alphabet books in good condition, but is lacking letter-tracing worksheets and phonetics flash cards, then volunteers will work to make or source these. 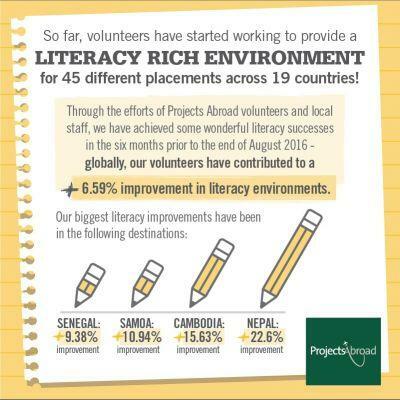 Our volunteers have been hard at work rolling out the implementation of Literacy Rich Environments – so far, this is taking place in 45 different placements across 19 countries. In the six months until the end of August 2016, we achieved a global improvement of 6.59% in the provision of Literacy Rich Environments. Success is measured as a placement that has moved up a level – so from ’needs considerable help’ to ‘needs some help’, and ‘needs some help’ to ‘needs no help’. Countries that have seen the biggest improvements include Nepal (22.6%), Cambodia (15.63%), Samoa (10.94%) and Senegal (9.38%). From a football pitch in Ghana to a global rollout of literacy improvements, we plan to build on our existing successes, one child at a time. For now, our experimental Football Pitch Reading project shows great potential for expansion. “It only started in June but the feedback from volunteers has been great,” says Jenny Puyo, Ghana’s Operations Manager, “We’ve started with one club for now but hope to expand it to two.” And for the volunteers that get involved, it’s a rewarding opportunity to really see the results of their efforts and know how they are contributing to the bigger picture. 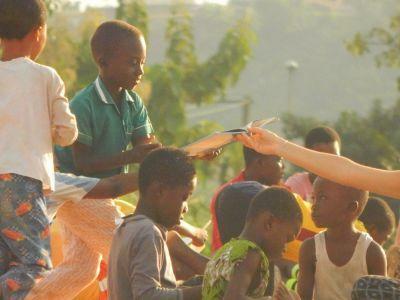 Find out more about our different Care and Teaching placements or take a look at our projects in Ghana .